Ten Stitch Blanket complete, blocked, ready to use! The Ten Stitch Blanket is finished! Knitting, weaving in ends, and blocking are all complete. I love the result, which is a 30″/76 cm square. The pattern is Frankie Brown’s well-loved Ten Stitch Blanket. The yarn is Kauni 8/2 Effektgarn in the blue/green/purple colorway EKS. The needle is 3mm double points, just two of them. Last time I wrote about this project, I concentrated on some key decisions for working the spiral and making the join. In storytelling terms, the middle of the story. This time I’ll focus on the beginning and the ending, with one amplification on the miters in the middle. The beginnings. I had 2 partial balls of Kauni and no more. 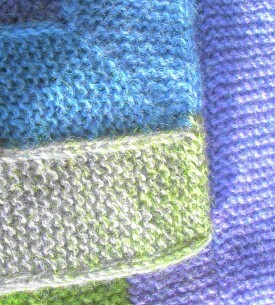 With 2 balls of yarn there are 4 ends: an inside and an outside end for each one. I looked at all 4 ends to find the best color transition from one ball to the next. I was lucky and did not have to cut into the yarn for a seamless color blend, but some may have to do that or live with a sharp divide in color. Knowing where I wanted to begin, I used waste yarn and a provisional cast on. The first row that I knit in Kauni was going to be on the side I designated as the wrong side; that is, the side without the knit-like welt formed by joining 10-stitch strips. 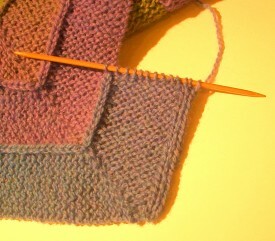 I knit 19 rows before starting the first miter. When the knitting came back to the cast-on edge, I released the provisional cast on and incorporated those live stitches with an SSK on each ridge. This avoids having a lumpy ridge of cast-on stitches on the wrong side of the blanket. Short-Row Ridge (SRR) 1: Sl 1, k 8, w+t, k to end. SRR 2: Sl 1, k 7, w+t, k to end. SRR 3: Sl 1, k 6, w+t, k to end. SRR 4: Sl 1, k 5, w+t, k to end. SRR 5: Sl 1, k 4, w+t, k to end. SRR 6: Sl 1, k 3, w+t, k to end. SRR 7: Sl 1, k 2, w+t, k to end. SRR 8: Sl 1, k 1, w+t, k to end. SRR 9: K 1, w+t, k to end. Barely a ridge, but technically it is. The stitch wrapped on this ridge is the only one in the corner that has only 1 wrap. From here on, you are adding a second wrap to the corner stitches. SRR 10: Sl 1, k 1, w+t, k to end. SRR 11: Sl 1, k 2, w+t, k to end. SRR 12: Sl 1, k 3, w+t, k to end. SRR 13: Sl 1, k 4, w+t, k to end. SRR 14: Sl 1, k 5, w+t, k to end. SRR 15: Sl 1, k 6, w+t, k to end. SRR 16: Sl 1, k 7, w+t, k to end. SRR 17: Sl 1, k 8, w+t, k to end. This adds the second wrap to the stitch at the edge. Miter finished! Resume working the regular pattern of joining the 10-stitch band to existing fabric. The ending and outer edge. The pattern does not call for doing anything special at the outer edge of the blanket. I wanted something more finished than garter stitch texture and decided to add I-cord edging. Simple 3-stitch I-cord. With long color changes in yarn like Kauni, applying I-cord after completing the basic fabric of the blanket would create quite a different rate of color change — not the look I wanted. Rather, I wanted the edging to be integral in color to the blanket fabric, which means knitting I-cord edging as part of the final 10-stitch band of fabric. At the point of the miter before I began the last complete spiral of 10 stitches, I cast on 3 stitches and began working them as I-cord. When mitering, I worked 1 row of I-cord only (no garter stitch at all) before and after SRR 9. When the 10-stitch band met the place where I-cord began, I worked 2 rows of I-cord only, then applied the I-cord to the live stitches with an SSK on each ridge. Finally, I grafted the cord stitches onto the original cord stitches. With a fixed amount of yarn and no more available to me, how did I know which miter was the place to begin I-cord? 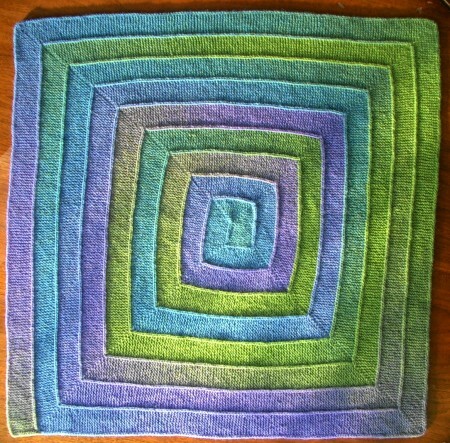 Or, which spiral would be the final spiral of the blanket? I had to figure that out with a tiny bit of help from Excel. Paula rolled her eyes at this. So for her sake, I’ll report on that method separately. 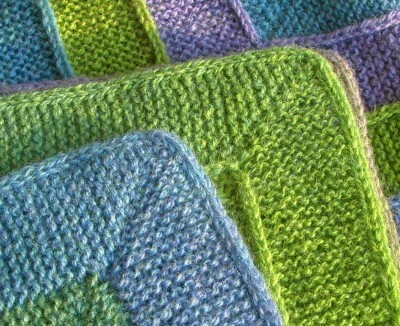 This entry was posted in knitting, technique and tagged edge treatment, gradient, I-cord, modular, Ten Stitch Blanket. Bookmark the permalink.